Flagship convertibles. These 13-inch 2-in-1s are thin and light enough to potentially replace both your existing laptop and tablet. 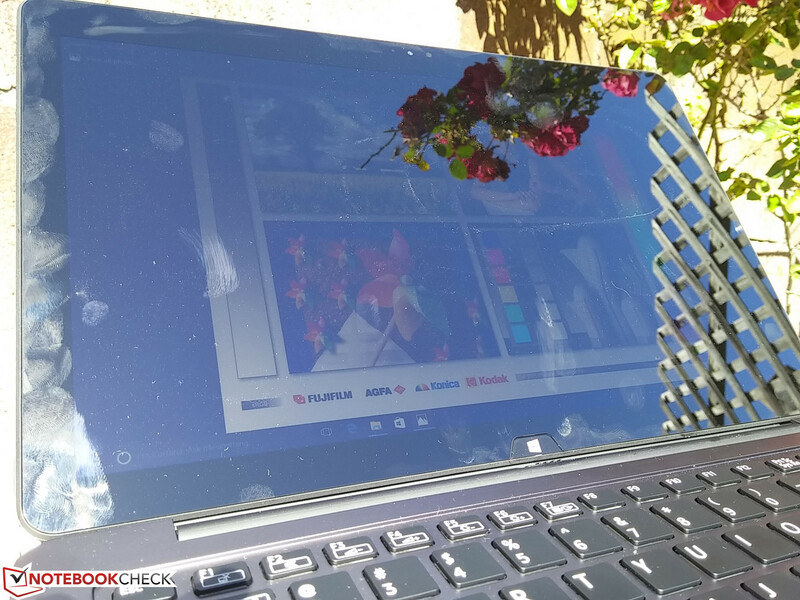 The new Kaby Lake Spectre x360 13 is perhaps the strongest contender in the category yet. 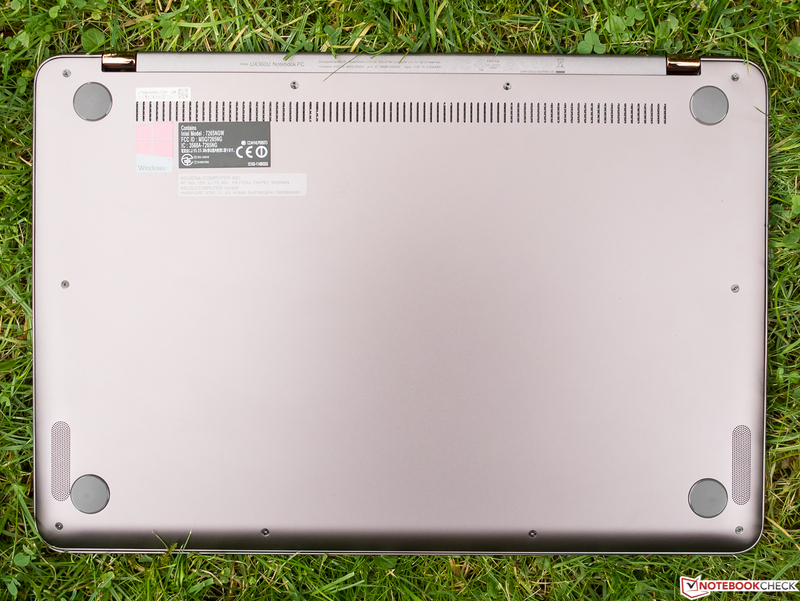 The first generation Lenovo Yoga convertibles weren't exactly the most ergonomic to use, but notebooks have become much thinner since then and are now more suitable for multi-mode designs. 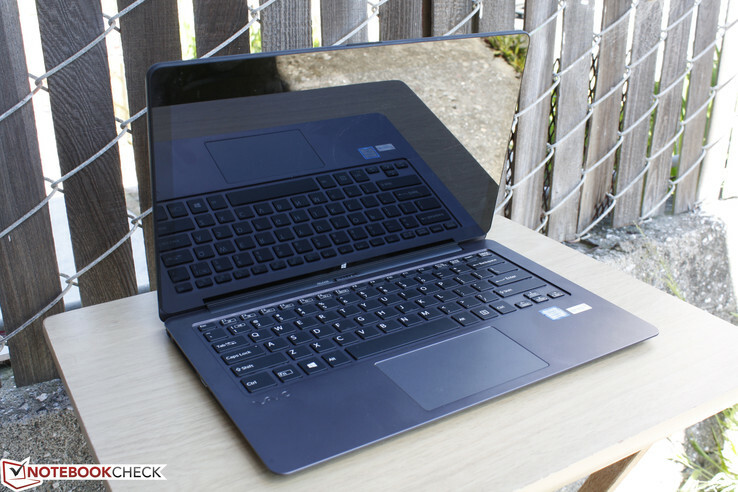 We compare the recently released Zenbook UX360UA with the older but still unique Vaio Z Flip and the newly redesigned Spectre x360 13 with ULV Kaby Lake options. These 2-in-1s retail for at least $1000 USD each and are some of the most versatile subnotebooks available for both work and multimedia. Only one, however, is a more solid recommendation than the others. 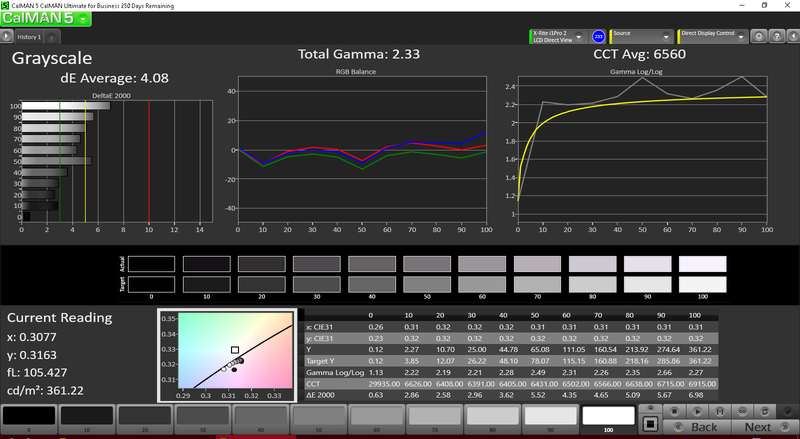 We encourage users to check out our dedicated review pages below for more data and detailed analyses of each of the three models. This comparison is by no means a replacement, but a condensed aid for those on the fence. 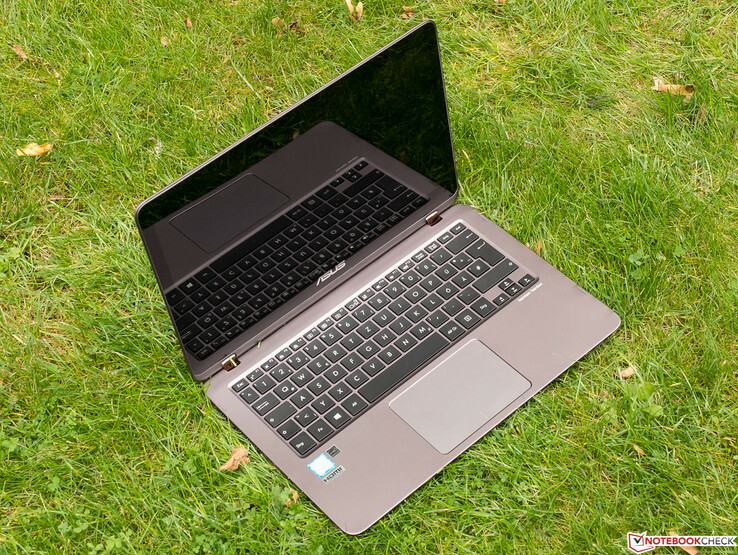 These flagship convertibles certainly look the part with their aluminum surfaces, but there are noticeable differences between them in terms of quality. 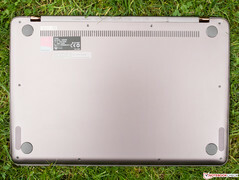 The base of the Asus is rigid and resistant to twisting while its hinges are very weak on certain angles even when compared to budget notebooks. 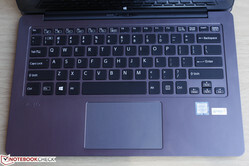 The Vaio is the opposite due to its uncommon "flip" mechanic, so the thick display actually feels stronger than the base with less creaking and warping. The new Spectre deserves praise as it is sturdy on all fronts while managing to be thinner and smaller than the Asus and Vaio. 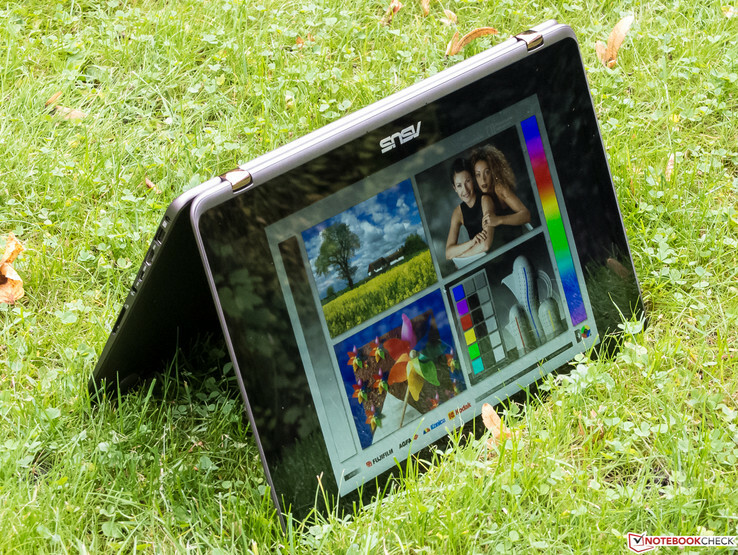 There are no prominent weak areas in its narrow bezel design with stronger hinges and a firmer base than on the Asus and Vaio, respectively. 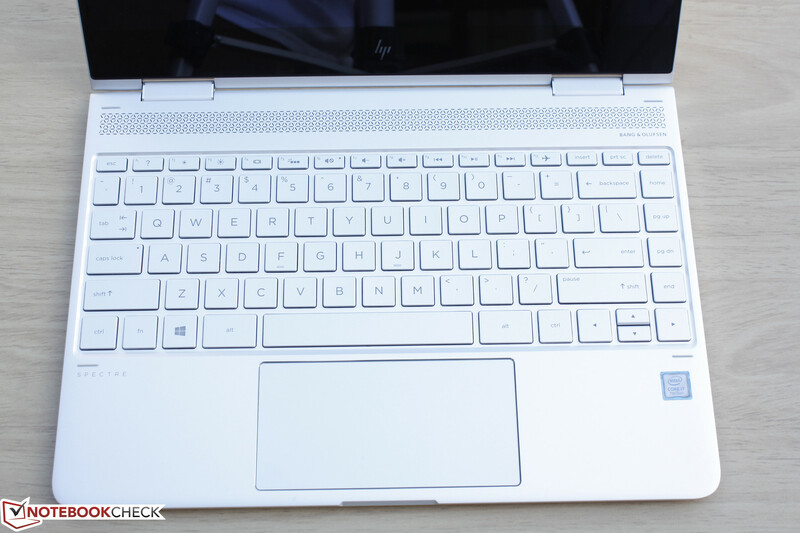 HP arguably offers the more well-rounded chassis that feels more comfortable when handling in both its tablet and notebook modes. Our size comparison chart below also includes the older Skylake Spectre x360 13-4104ng in addition to the redesigned Kaby Lake x360 13-w023dx to illustrate the size and weight differences between the two. 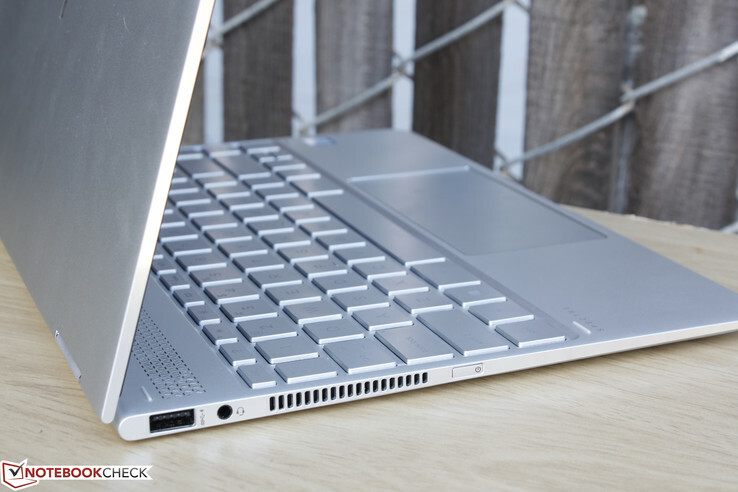 The Spectre x360 13 stands out the most as it is the only one with Thunderbolt 3 ports and no HDMI or even an SD reader. The Thunderbolt port is very versatile, but owners will have to rely on optional adapters since the HP carries almost nothing else. 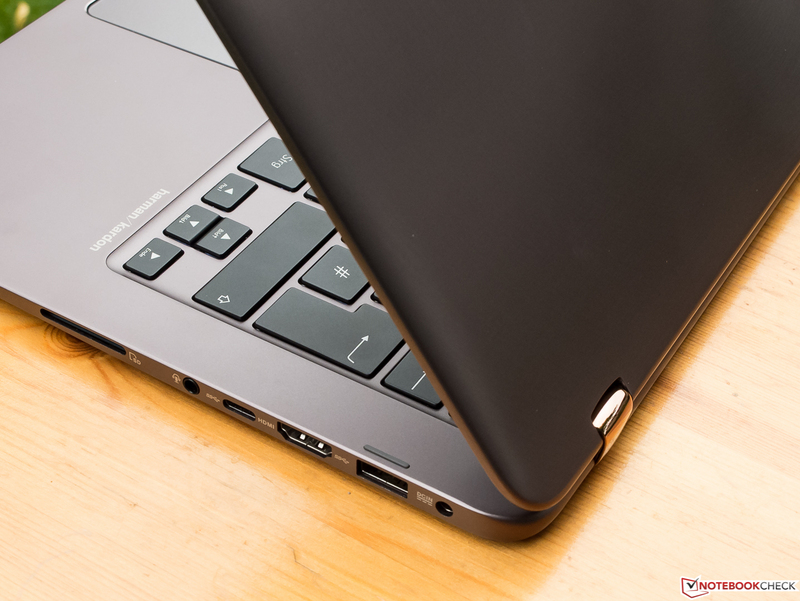 The Vaio has more USB Type-A ports than the HP and it ships with an active stylus as well, but the lack of any USB Type-C ports will eventually be an inconvenience as smartphones are beginning to drop Micro-USB in favor of the reversible alternative. Asus' Zenbook is the middle-ground with HDMI, SD card reader, and a standard USB Type-C Gen. 1 port. 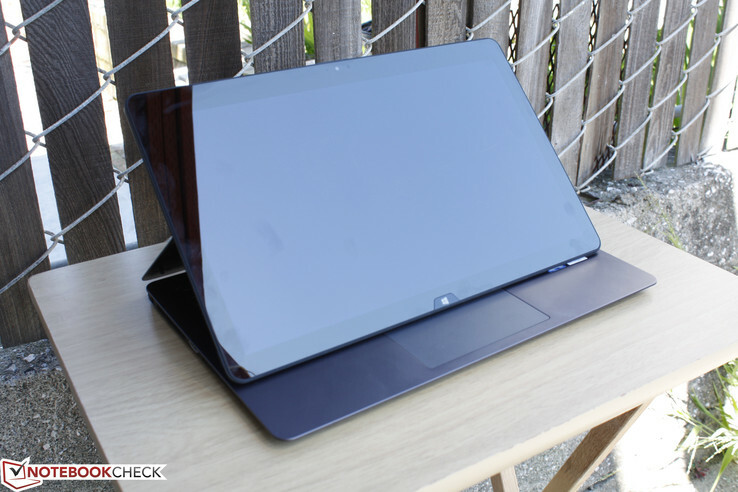 Users who frequently use these convertibles in tablet mode will appreciate that the Asus and HP each have volume rockers on the edge for easier volume control. The typing experience varies only slightly between the notebooks. We find the keyboard on the Asus to be roomy for such a small screen size, but its spongy feedback and loud clatter will take getting used to. 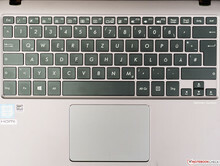 The HP and Vaio keyboards are comfortable in terms of size as well with quieter keys than on the Asus, though feedback is still on the soft side when compared to the AccuType keyboards on newer Lenovo systems. 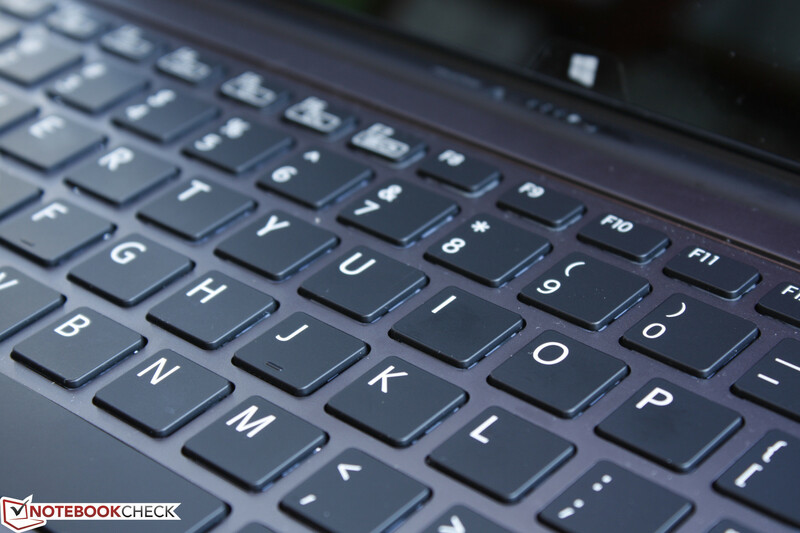 The integrated clickpad on the Asus showed issues during our time with the test model. 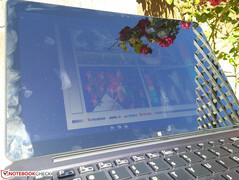 Surfaces around the edges would not always respond reliably to simple cursor movements and the pressure point on the integrated mouse clicks can feel soft. 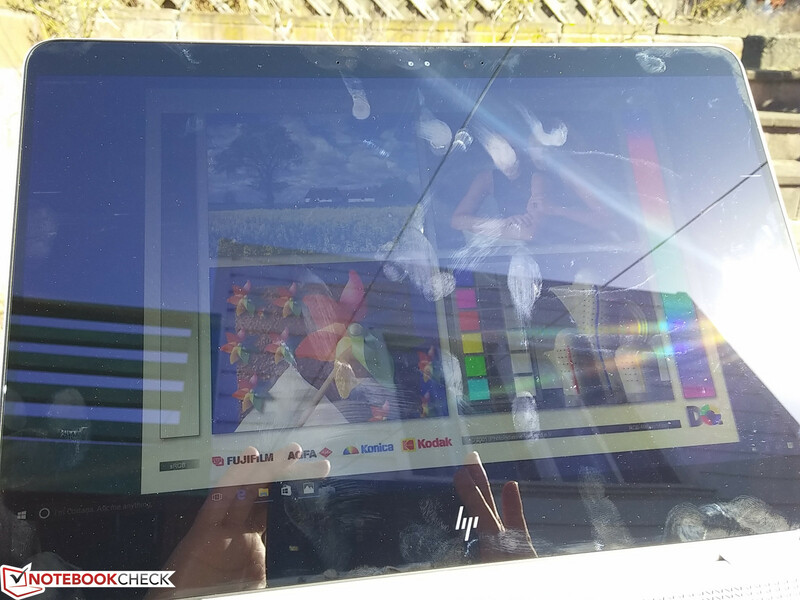 Meanwhile, the clickpads on the HP and Vaio are comparatively easier to use with no issues regarding responsiveness or glide. 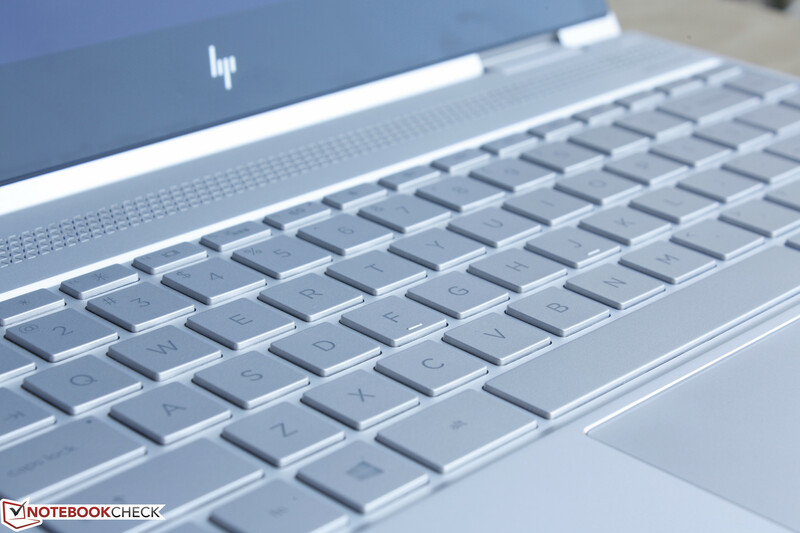 The integrated mouse keys on both are shallow with firm auditory clicks when pressed while the extra-wide surface area of the HP clickpad makes it more comfortable to use than on the other two. 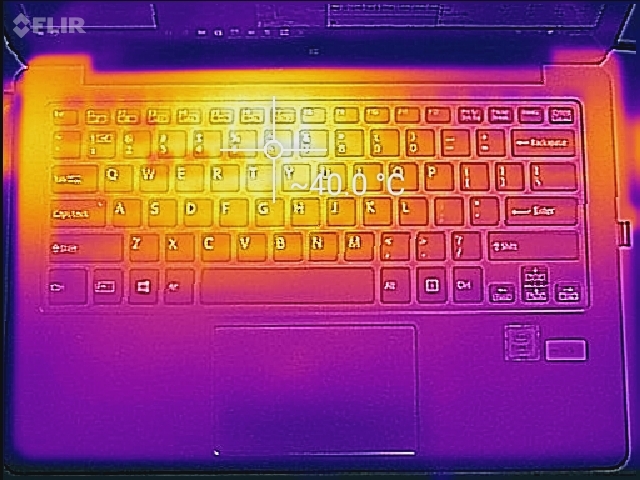 Though minor, it's worth noting that the keyboard backlight on the HP glows more unevenly and provides only one level of lighting compared to multiple settings on the Asus and Vaio. Brightness and contrast are even more important on convertibles compared to your standard notebook. 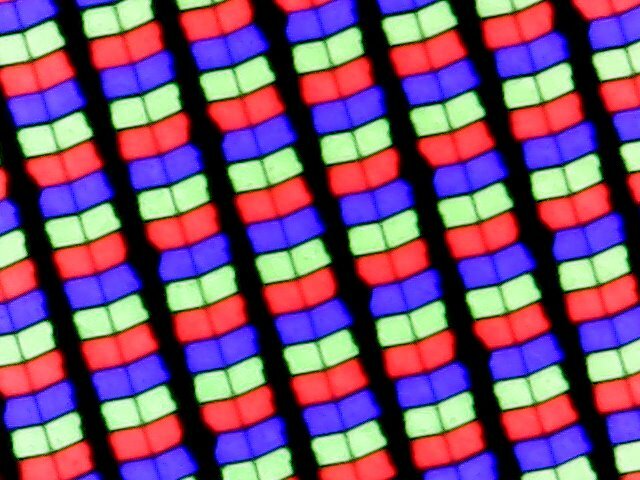 The glossy panels here are fortunately of high quality with wide gamuts and edge-to-edge glass protection. 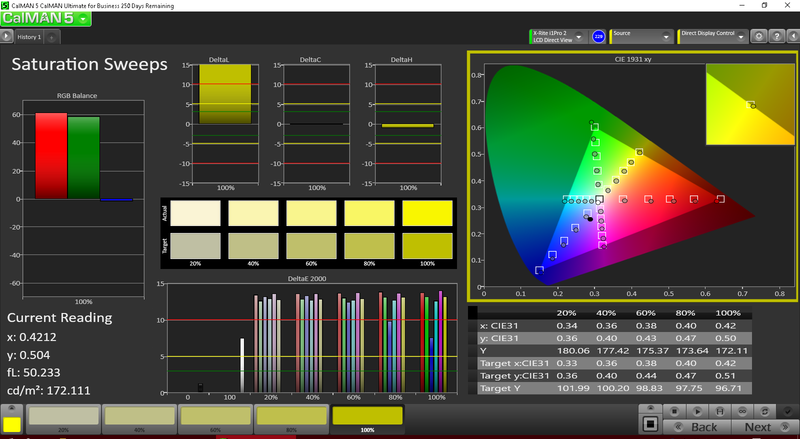 The Vaio display is slightly better than on the Asus and HP due to its brighter backlight, higher resolution, and marginally deeper colors. 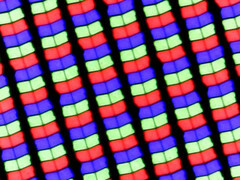 While the 1440p resolution results in sharper texts and images, some applications will inevitably run into scaling issues when compared to 1080p panels. 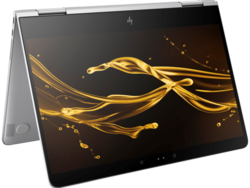 The latest Kaby Lake Spectre x360 13 is currently shipping without 1440p resolution options compared to the outgoing Skylake Spectre x360 13-4104ng. 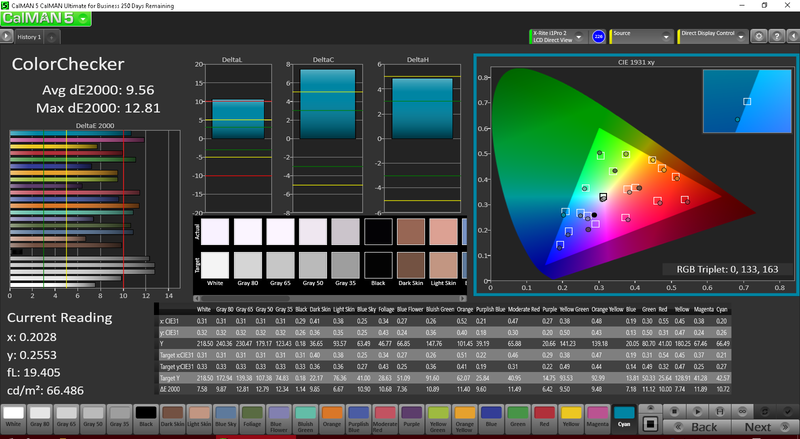 We've included the 1080p Skylake SKU in our comparison table below to show that there are no significant color, contrast, or brightness differences between the two. 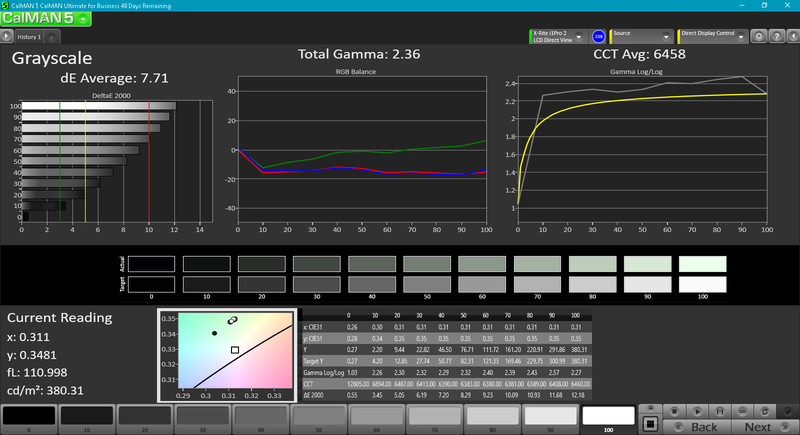 It's worth noting that pulse-width modulation was only detected on our Zenbook UX360UA and not on the HP or Vaio. 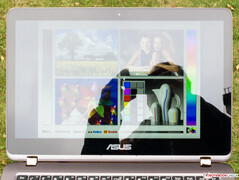 Users sensitive to onscreen flickering may want to avoid using the Asus notebook on lower brightness levels to reduce the chances of eyestrain. 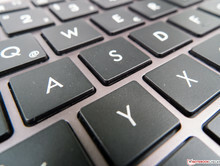 Asus, HP, and Vaio offer multiple CPU options for their respective notebooks. Our comparisons below reflect only the configurations we have on hand. 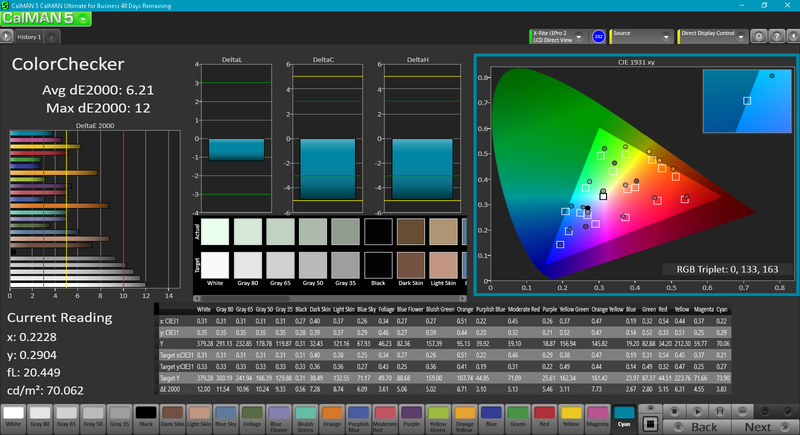 CineBench benchmarks show minimal CPU performance differences between the older Skylake i7-6500U and the newer Kaby Lake i7-7500U in the Asus and HP, respectively. 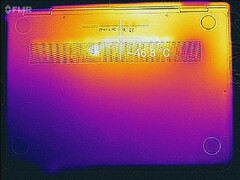 Meanwhile, the uncommon i7-6567U in the Vaio is about 15 percent faster in both single- and multi-threaded workloads. A main reason for its stronger performance is the higher TDP ceiling of almost twice that of the i7-6500U and i7-7500U for higher core clocks and Turbo Boost potential. 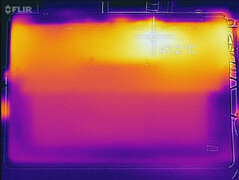 On the flip side, this has implications on core temperatures, fan noise, and battery life as well. 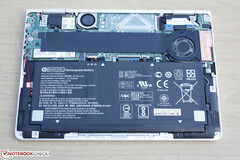 As for serviceability, all three systems have limited expansion options outside of their M.2 SSDs and are not meant to be dismantled by the end-user. 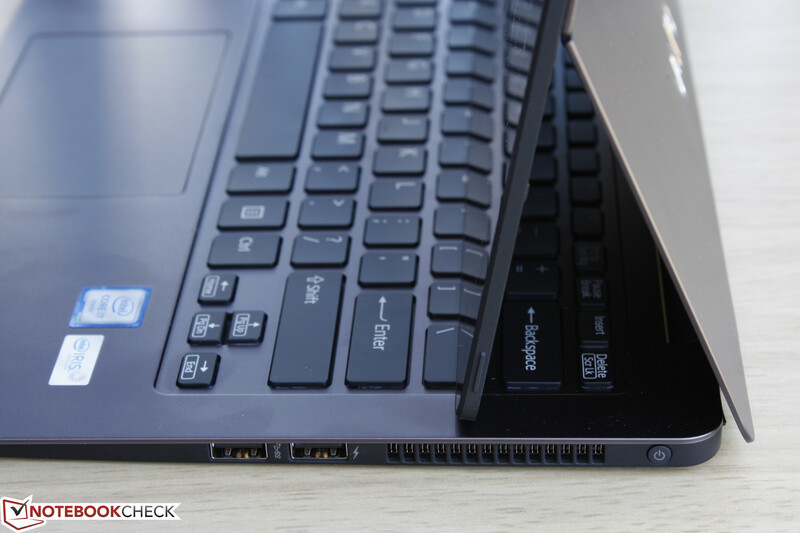 Processor and RAM modules are soldered as expected on these 2-in-1 notebooks. See our dedicated CPU pages on the Core i7-6500U, i7-7500U, and i7-6567U for more benchmarks and comparisons. We've shown in our review of the Spectre x360 13 that its Kaby Lake CPU is slightly slower than our reference MSI CX72 with the same i7-7500U processor and this extends to its graphics performance as well. 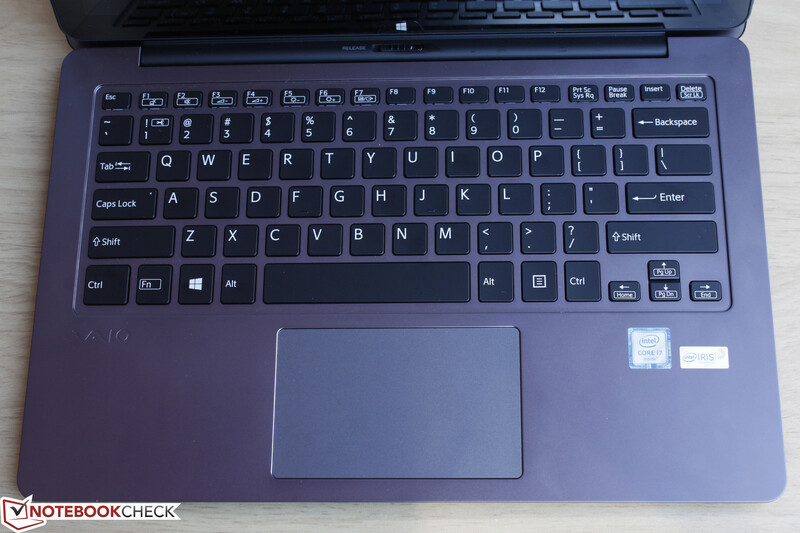 Despite having the new HD Graphics 620 GPU, the older HD Graphics 520 in the Zenbook UX360UA is nearly as fast with a difference of just a few percentage points according to 3DMark and Bioshock Infinite benchmarks. 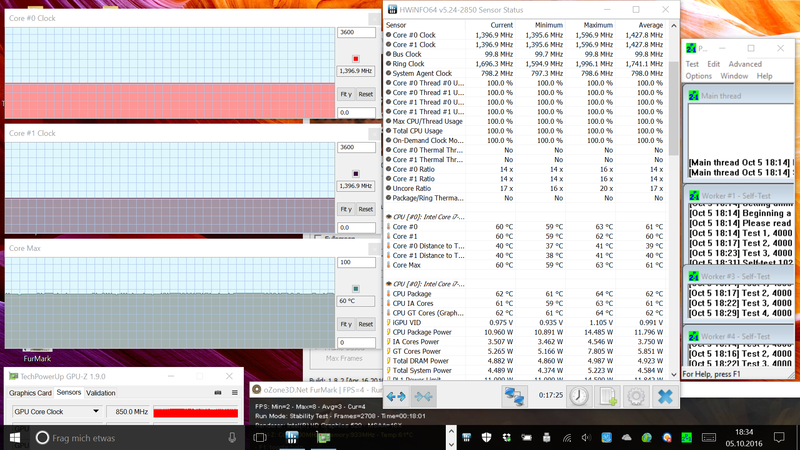 The Iris Graphics 550 in the Vaio is notably faster than both the Asus and HP by at least 30 percent according to 3DMark Ice Storm. Real-world performance in games may be even better, though raw performance is still not good enough for 1080p gaming on most modern titles. 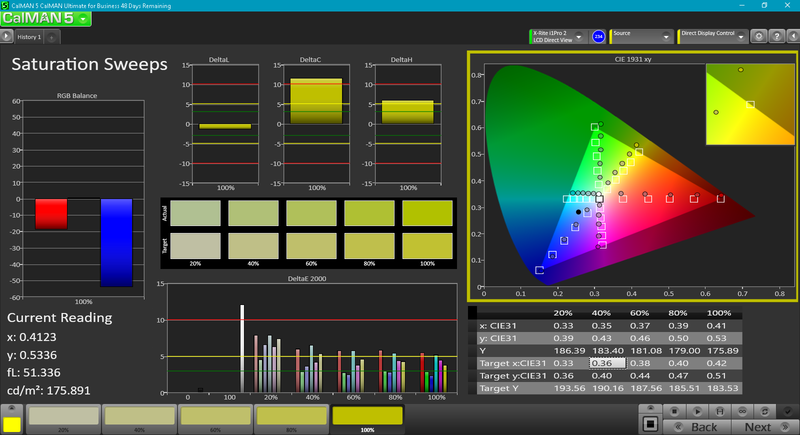 See our dedicated GPU pages on the HD Graphics 520, HD Graphics 620, and Iris Graphics 550 for more technical information and benchmark comparisons. 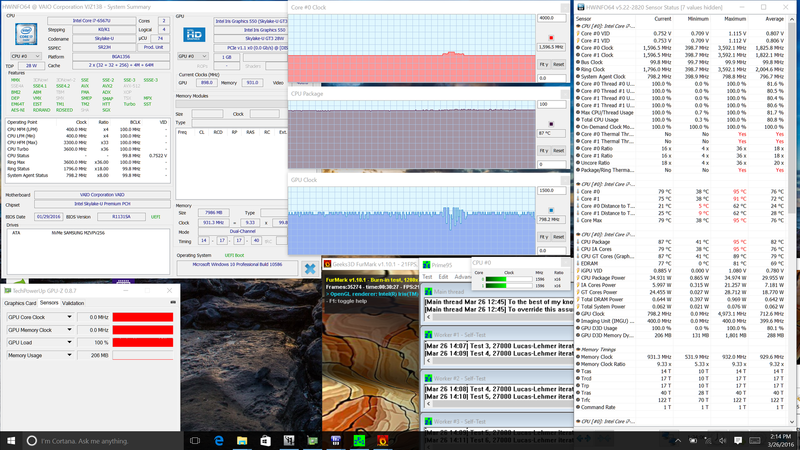 We run both Prime95 and FurMark to simulate maximum stress and to test system stability. These unrealistic conditions do not represent daily workloads and are instead meant to put both the CPU and GPU at 100 percent capacity. 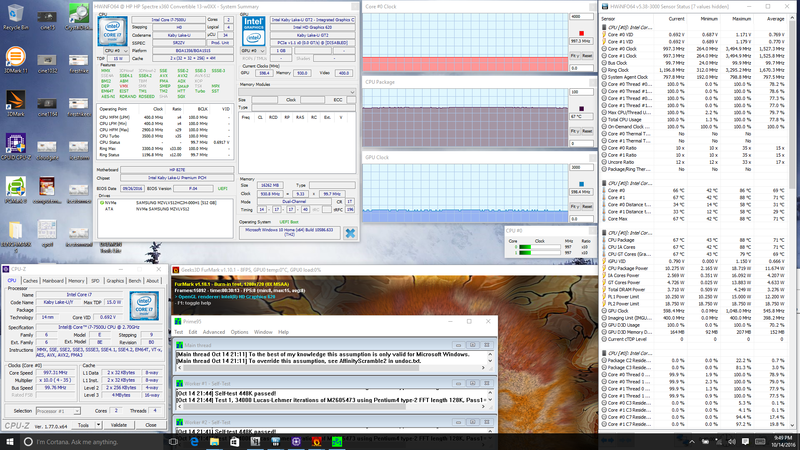 Throttling occurs more heavily on the Kaby Lake HP system than on the Skylake CPUs on the Asus and Vaio. 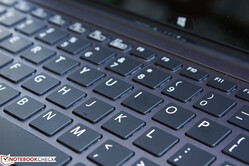 The Vaio stabilizes at the higher CPU clock rate of 1.6 GHz while the Asus stabilizes at a higher GPU clock rate of 850 MHz. 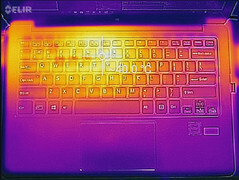 Meanwhile, core temperatures are significantly warmer on the on Vaio by 20 C or more when under heavy stress compared to its two competitors. 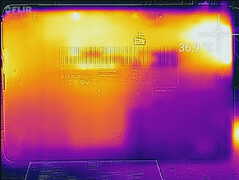 Fan noise is silent or very close to it when idling on all three systems. The Asus and HP behave similarly when under heavier loads with the HP running just slightly louder and closer to the 40 dB(A) mark. 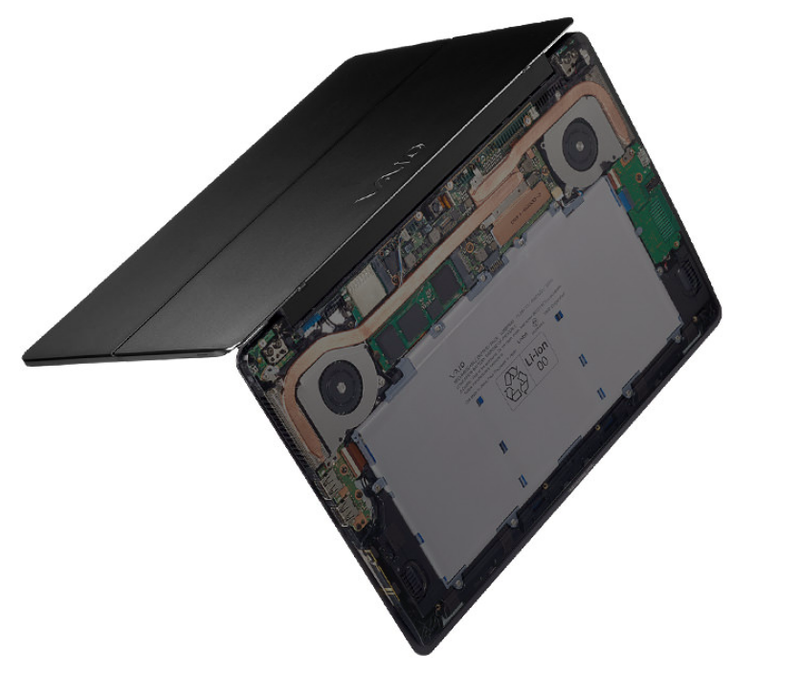 The much more powerful Vaio is not only the loudest of the three when under stress, but it's also one of the loudest convertible Ultrabooks available. 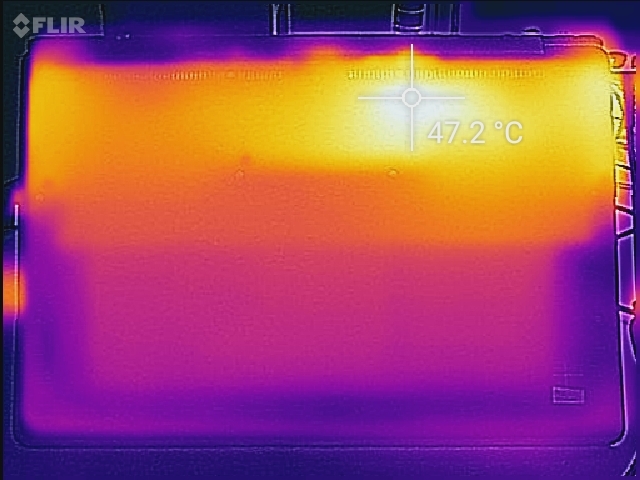 This is somewhat disappointing as the Z Flip is thicker than both the Asus and HP with warmer processor temperatures as shown in our stress test section above. Surface temperatures are generally flat on the three systems when idling with the Vaio notebook being slightly warmer towards the rear. 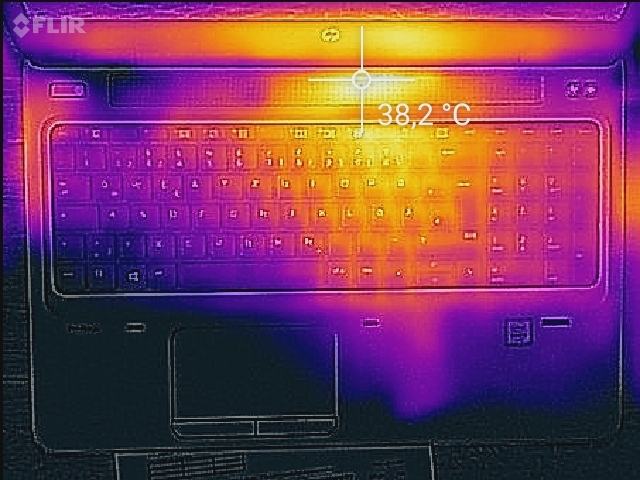 When under heavy load, the Asus notebook is the coolest by far at just over 38 C on its warmest spot compared to 48 C and 47 C on the HP and Vaio, respectively. Hot spots are concentrated above the first row of keys on the keyboards of the Asus and HP where fingers and palms are less likely to touch. 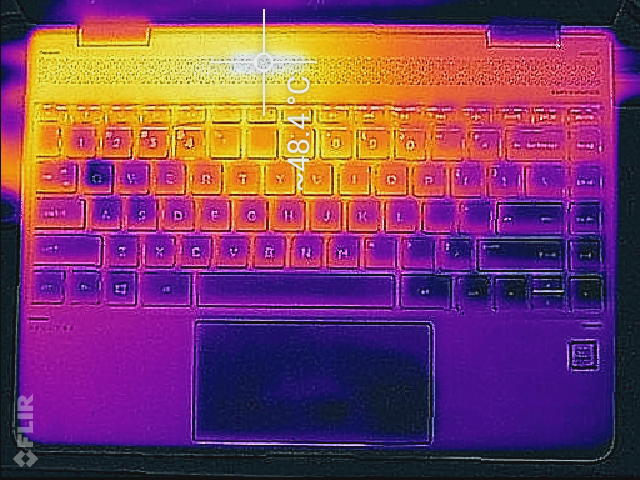 The hot spot on the Vaio, however, is closer to the center of the keyboard for a warmer typing experience as shown by our temperature maps below. 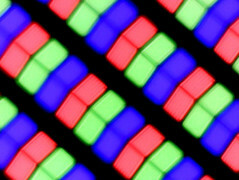 The three systems draw about the same wattage when idling on desktop. 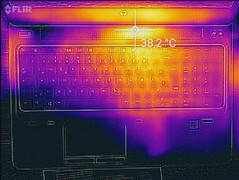 Differences begin to show when the notebooks are put under processing stress with the HP becoming slightly more demanding than the Asus under similar loads and the Vaio outpacing both by as much as 10 Watts or more. 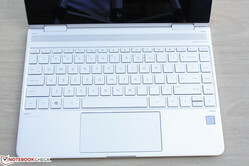 The Vaio convertible may have the largest battery capacity, but runtimes are still about two hours shorter than both the HP and Asus when under similar WLAN loads. Users can expect about 9 hours of real-world use out of the HP and Asus compared to about 7.5 hours on the Vaio. 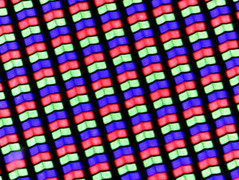 Both the higher resolution display and more powerful CPU can be to blame for the shorter runtimes and higher power consumption of the Z Flip. It may not be the quietest or fastest of the bunch, but its quality, superior ergonomics, and small size shouldn't be understated. Is one convertible objectively better than the other? 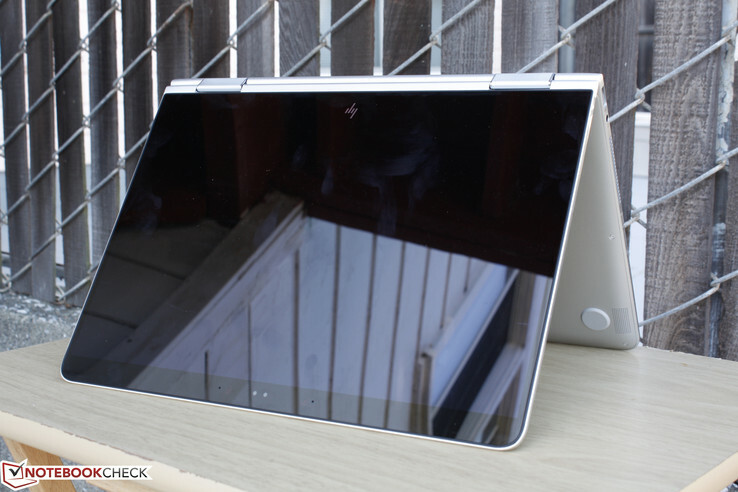 Performance-wise, the Vaio Z Flip carries the faster and more demanding processor and Iris GPU. 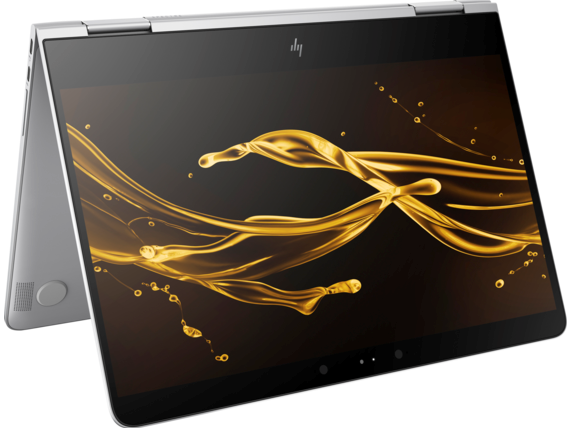 The HP disappoints here because its Kaby Lake CPU is not significantly faster than the Skylake Zenbook UX360UA and is even slower than our reference i7-7500U due to its weaker Turbo Boost. 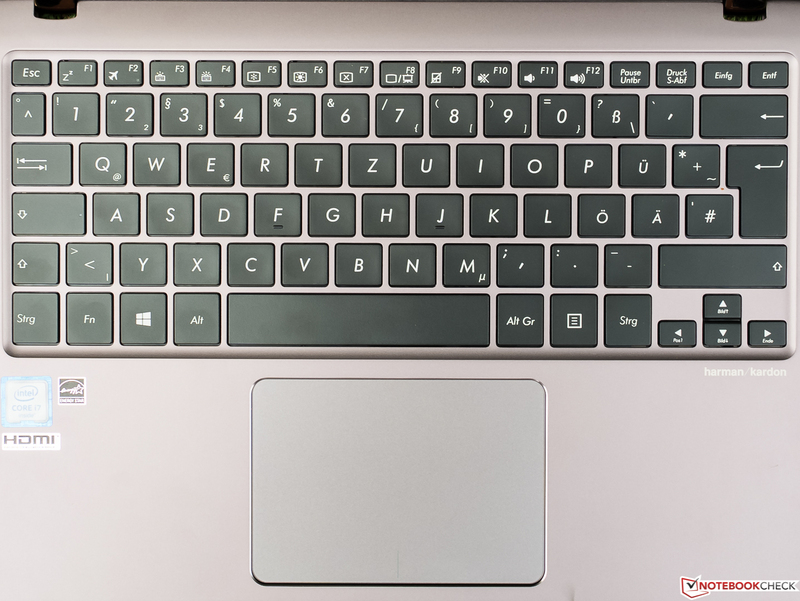 The more powerful Vaio comes with notable costs, however, including shorter runtimes, louder fan noise, warmer temperatures, and a thicker chassis than both the Asus and HP. The new Spectre x360 13 still comes out ahead for everyday use and travel with more docking options from having multiple Thunderbolt 3 ports. 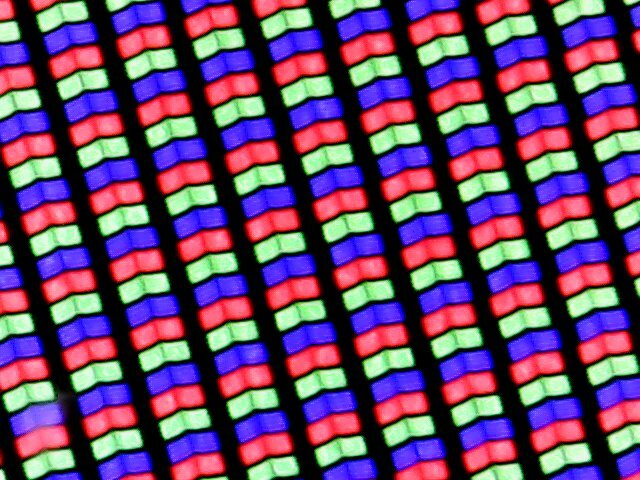 Its smaller dimensions make tablet mode feel more natural without sacrificing build quality or keyboard size, which are major challenges for any convertible. 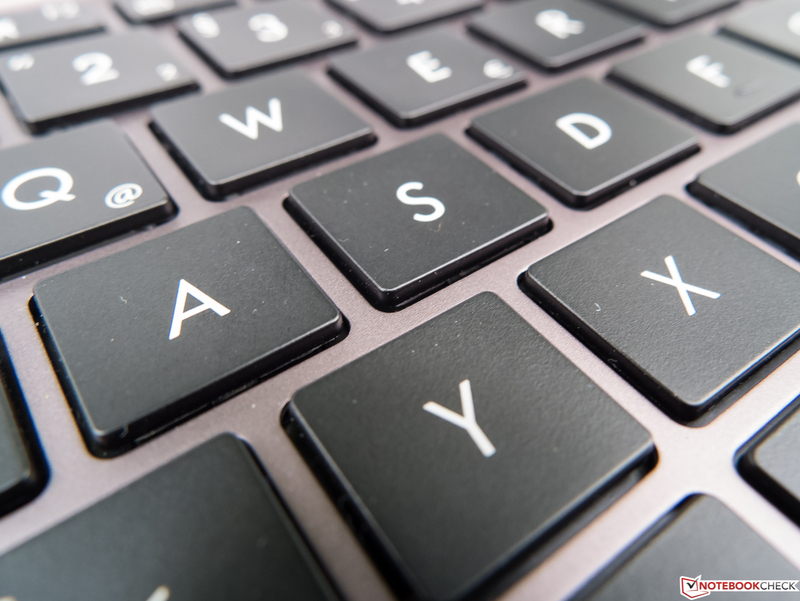 The Asus and Vaio don't offer significant enough advantages and often come out behind when it comes to chassis quality or keyboard comfort. 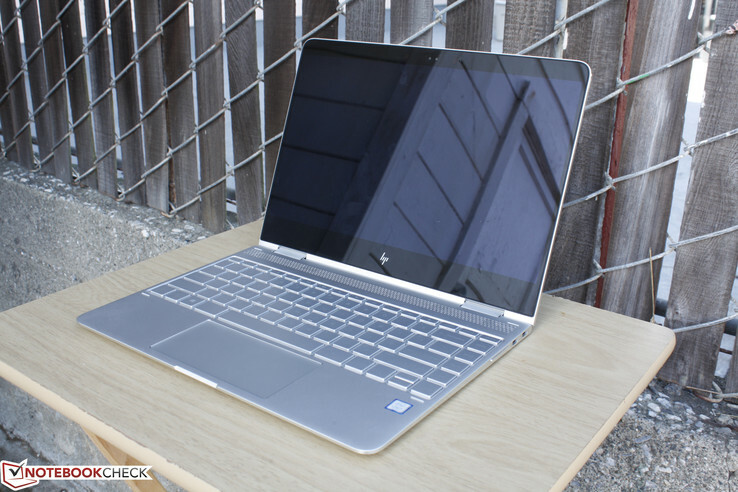 Nonetheless, the lack of any HDMI ports or an integrated SD reader on the HP Spectre can be a deal breaker to some.